Mites/Flea Control Get Rid of them Naturally!!! How Does Grandpas Diatomaceous Earth Work? How does it help mites/flea control? To us, as humans is a very fine powder but on a microscopic level it is sharp, this is how it works. 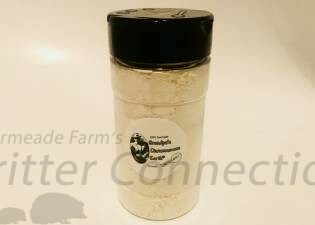 once a flea come in contact with it, Diatomaceous Earth begins to make little cuts into the flea, causing it to dehydrate and die, unlike other products, Grandpas Diatomaceous earth does not poison the mites/fleas, so the mites/fleas never can become immune to this mites/flea control process. Diatomaceous Earth, will need to be in its dry powder state to be most effective for mites/flea control, we would not really recommend applying to your animal if they have damp fur because of a bath, diatomaceous earth will then turn more into a mud and not be able to catch on to the mites/fleas, as well as it can dry. so if you apply it to your pet, and you give them a bath or they play in some water you will need to reapply diatomaceous earth when their fur is dry. How long will it take to kill them? using Grandpas Diatomaceous Earth for mites/flea control, there has been some research done showing it takes 4 to 12 hours to kill mites or a flea when coming in contact with diatomaceous earth, we recommend when you do a treatment, you leave it for 24 hours at a time, just ensuring you get as many mites/fleas at one time as possible. You will want to do applications twice within the first week (recommended). then once a week for 3 weeks following. Most people notice a majority of mites/fleas are gone by the end of week 2, we recommend to stick it out for another 2 weeks to avoid a reinfestation. This is food grade, so not harmful if ingested.